Moses “Mo” Lobeau is a very different girl. She has always been looking for her “Upstream Mother,” ever since she learned she was found in a stream during a storm. 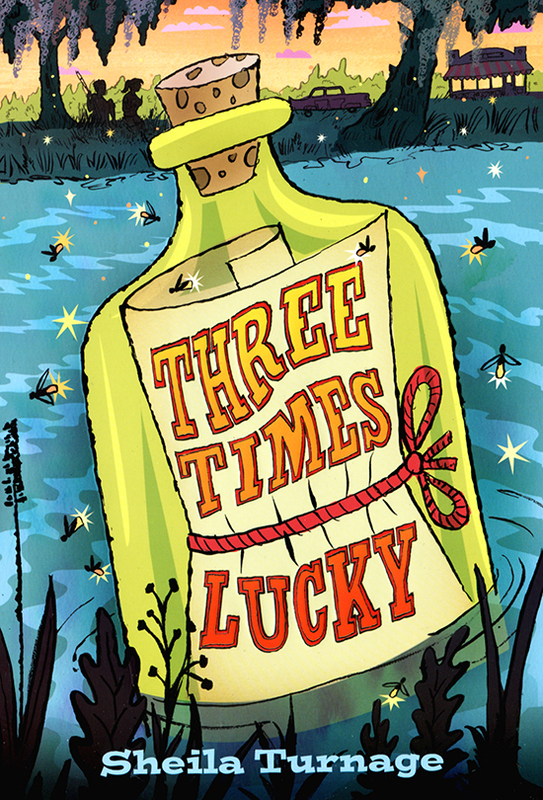 Everyone calls her unlucky, but she calls herself three times lucky. Once, for her mother tying her to a floating billboard, twice for the Colonel crashing his car and finding her, and three times lucky for Miss Lana taking her in as family However, this summer is looking good. She’s going to karate with her friend Dale, fishing with a “borrowed” boat, and helping out with the cafe run by her adoptive parents, Miss Lana and the Colonel which sounds a little too good to be true. However, this peaceful little town receives a nasty surprise when a cafe customer is murdered, and when a team of detectives show up they discover something terrible has happened. With a hurricane coming, Mo and Dale must solve a puzzling mystery while racing the clock and find out who is behind it all. 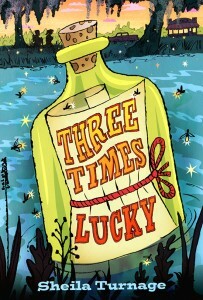 I find Three Times Lucky very suspenseful and funny, with the characters being a great part of this. The characters all seem real in the way they react to the numerous events, and act in a dire situation, but they all seem very different, like how Mo goes into a rage or how Lavender is very serious. They act scared, confused, determined, and relieved all in different, believable ways, like when Mo goes into shock after the kidnapping, or how she sends letters in a bottle down the stream to her “Upstream Mother,” so, “If water took me away from her, water can bring us back together.” Overall, I highly recommend this book for its great plot twists and characters like Mo and the Colonel, who are extremely believable and funny.